The western limits of Almeria province, from north to south, unite with the province of Granada, its only Andalucian neighbour. Not taking away from all the unique destinations and adventures that Almeria has to offer, if you are living or on holiday in Almeria it would be a shame not to take advantage of the closeness in locality to the special attractions that are situated just across the border. 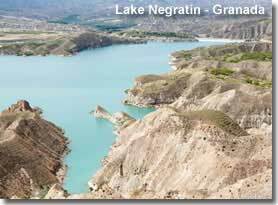 Situated to the north of Granada province Mount Jabalcon and Lake Negratin sit side by side in a region known as El Altiplano de Granada, a vast plateau fringed by mountains and incorporating the protected natural parks of Sierra de Baza and Sierra de Castril. Standing proud at a height of 1492 metres above sea level Mount Jabalcon can be seen for miles around, not surprisingly the views from its peak present breathtaking, all encompassing vistas including the badland landscapes of the plateau, the contrasting mountainscapes, which reach as far as the Sierra Nevada, and, in the immediate vicinity, the stunning vision of Lake Negratin. To best appreciate Mount Jabalcon it is possible to take a mountain trail, by vehicle or mountain bike, around the mountainside and up to its summit, both the circular and summit routes are signposted from the village of Zujar, the summit route leads to the Ermita de la Virgen de la Cabeza chapel, named after the patrona of the village. The Romeria de la Virgen de la Cabeza, a local fiesta celebrated at the end of April, involves the villagers taking a parade, along with the statue of the virgin, from the village to the chapel, visitors are welcome to join the elaborate procession. 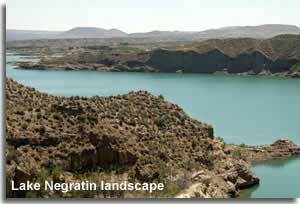 Zujar is reached along the A-315 to the north west of Baza town. A popular location for outdoor pursuits, besides walking, mountain biking, and rock climbing the mountain has established and signposted launch points for paragliding or hang gliding, strong ascending currents create ideal conditions for the sport, attracting enthusiasts all year round. 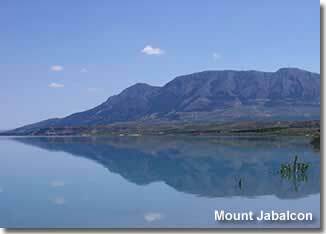 I did consider the prospect of a enjoying a picnic while taking in the views from the Jabalcon peak, but decided that this time, for once, I would pass on the narrow mountain tracks and admire the scenery and the mountain from a lower level, and I chose to spend my time here down by the lake. 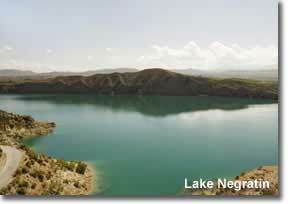 Lake Negratin is one of Andalucias largest freshwater lakes, formed by the Negratin Dam on the Guadiana Menor River, access can be achieved along the A-315, from any of the villages of Freila, Zujar or Cuevas del Campo. A dazzling sight of aquamarine, or cobalt blue, depending on the time of day and the suns location, with a backdrop of rugged cliffs on its northern bank, the lake offers a scenic destination to take time out and enjoy the peaceful surroundings. Canoeing and sailing are advertised from the El Negratin Club Nautico, a sailing club with a lake side restaurant located and signposted from the village of Cuevas del Campo. I visited the lake with my mum and dad, while they were holidaying with me, I wanted to get their feedback on this destination that was also an unknown to me. 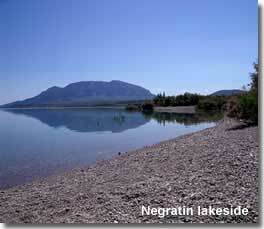 We chose to approach the lake from the pretty village of Freila, and considering it was a Saturday at the end of the month of May, and a very beautiful sunny day at that, we were surprised to find that the shores of this part of lake were deserted on arrival. It was like being transported to another world, we spent at least an hour in total seclusion, the only disturbances being the sounds of nature and the occasional fish jumping out of and back into the water. Eventually we were joined by two more people who selected a spot further along the waters edge to the right of an area of bushes, hence still allowing all of us almost complete privacy. A surreal and natural hideaway, this inland beach area, consisting of pebbles, shrubs and overgrown bushes, is overlooked by a perfectly situated lakeside restaurant with a covered and an open terrace offering enchanting views for daytime and evening dining. This particular area of the lake is located by following the sign for the zona recreativa from the main A-315 just before the village of Freila, the track leads directly to the restaurant car park and waters edge after passing a caravan camping site. 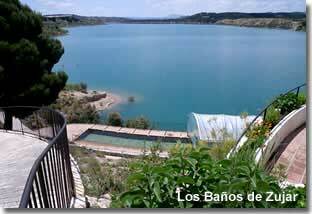 A favoured year round attraction at the lake is the Los Baños de Zujar, an outdoor thermal mineral water pool situated in a slightly elevated position on the edge of the lake at the base of Mount Jabalcon. The pool is located approximately nine kilometres from the village of Zujar by taking the Avenida de Los Baños in the direction of the lake and following the signs for baños termal. The constant temperature of the bathing water, maintained from the mountains natural hot spring, is said to have therapeutic qualities. Certainly a relaxing experience, and enhanced by the splendid setting, a visit can be completed by enjoying a meal or refreshments at the Los Baños restaurant which has both a covered and open air terrace overlooking the lake and pool. Access to the pool and the changing area is via the restaurant, where a small charge is made to help cover the cost of maintenance. Car parking is available in a designated area beside the restaurant. *Information established in June 2016. Mum and dad were absolutely thrilled by this spa experience, as was I. We swam and lounged in the lovely warm waters, the sun shining above us, the expanse of the lake glistening in front of us and the hillside greenery of Mount Jabalcon directly to our left. This part of the lake was a little busier than our first destination, just, there were a couple of groups of people who had set up their own picnic areas on the shores close by, and two guys were fishing from a rocky area to the right of the restaurant, the baños themselves had 3 other bathers besides us, though a couple of families were arriving as we were leaving. Even if the quantity of visitors in the pool had been much higher, as I suspect they would be in the height of the season, the alluring setting is more than enough to warrant a visit. A very easy to reach destination, all in all mum and dad were bowled over by the whole trip, in the main by the unsurpassed natural beauty all around them. I couldn't agree more, this really is a special place to visit. 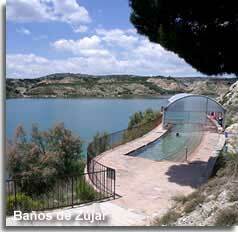 El Negratin Club Nautico sailing club, Cuevas del Campo, the website is only available in Spanish.